How Can a Parent Help a Slow Learner? If your child struggles in one or more areas of school, he or she may be a slow learner. Continue reading for more information about slow learners and for ways to support your child outside the classroom. Slow learners are students who've progressed normally in the developmental areas of physical dexterity, social aptitude and concrete thinking ability, but who consistently struggle in one or more school subjects. These children usually don't display learning disabilities; however, they take more time than their peers to acquire abstract thinking and reading skills. They may struggle with multiple-step instructions, standardized achievement tests and self-esteem. As with any student, slow learners are capable of mastering new concepts with concentration and practice; however, they may need extra time for review. Consider hiring a private tutor to work on homework assignments with your child after school. One-on-one assistance may help your child stay on-track with his or her homework and strengthen the development of an effective learning style. A professional tutor may have experience working with slow learners. Alternatively, you can also hire or ask a high school student to tutor your child. Children enjoy working with teenagers, and a high school student's manner of speech may help your child pick up unfamiliar concepts with greater speed. Your local high school may have a list of students available for tutoring or offer a mentoring program. Eating breakfast and getting enough sleep are two factors that have been shown to encourage learning (www.health.ucsd.edu). A minimum amount of stress at home also can promote an environment without distractions, which many slow learners need when they're working on homework assignments. Provide a quiet place for your son or daughter to study where he or she can easily communicate with you. Organize your child's homework sessions into brief periods that allow time for review. When he or she has completed a new assignment, suggest a fun activity that relates to the concepts just learned. Free math and verbal games are available online in a variety of topics. Your child might also enjoy painting a picture or performing a theatrical skit related to the learned concepts. Allowing for variety within your child's homework sessions may reinforce his or her capacity for recall. Offer your child choices during homework sessions. You might ask him or her to order homework assignments, choose a scratch paper color or propose an activity to do once the homework period is over. When your child feels a degree of autonomy with his or her schoolwork, he or she is more likely to actively engage in academic activities. Allot one or two activities per homework assignment that highlight your child's strengths. Speak with his or her teacher about minimizing the amount of problems he or she must complete per homework assignment to enhance a feeling of self-accomplishment. Make sure to give your child enough time to think through homework problems; it's helpful if he or she doesn't feel overwhelmed by a time constraint. Before bed, review the concepts your child has worked on that day. Ask him or her questions about school topics. Explaining concepts aloud may improve your slow learner's ability for recollection and articulation. Finally, consider taking your child to lively places where academic skills are used outside the classroom, such as an aquarium or a local university event. If you expect that your slow learner will eventually grow out of his academic challenges, your child may feel your lack of acceptance of his or her present condition. It's helpful for your child to feel supported by you, regardless of the pace at which he or she learns. According to Jere Brophy's book Motivating Students to Learn, students with high levels of self-confidence learn with greater ease than children who are overwhelmed by anxiety or a fear of failure. 'Roll Over!' is based on a counting song originally written by Edith Fowke. 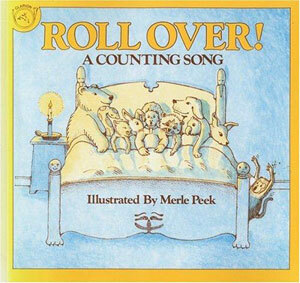 The popular picture book version of the song is illustrated by Merle Peek. 'Roll Over!' is a good fit for reading aloud to one child or a group, whether read as a story or sung together.